Despite having lived through some of the most dramatic changes of the 20th century, Stanley Anderson (1884-1966) created a vision of an essentially timeless English rural tradition in his etchings and woodcuts. Anderson was a key figure in the revival of engraving in the 1920s, and the technique's exacting craftsmanship, intimate scale, and indelible sense of historicism were a stark contrast to the modernist explosion. 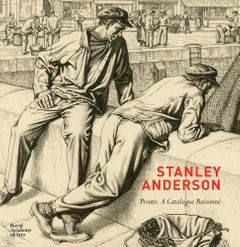 This catalogue raisonne gathers, for the first time, the complete oeuvre of Anderson's prints, from the townscapes of his early career to his fascinating 20-year study of rural crafts, including hedge-laying, carpentry, and barrel-making. Robert Meyrick is head of the School of Art and keeper of the School of Art Museum and Collections at Aberystwyth University, Wales.